Tuesday Tip: Have You Made a Pen Pal Today? So I adventured out to meet another blogger buddy of mine, Becky Povich, and if you’ve read her blog, you won’t be at all surprised that we shared a lot of laughter and a lot of topics in a very short time! Let’s see…we discussed writing and blogging, and making new friends and blogging, and books in the works and blogging and mutual writing/blogging aquaintances and peach milkshakes and blogging…well, I think you get the picture. But here’s the actual picture, just in case you’re still wondering. You know, I always wanted a pen pal when I was a kid. Better late than never! Hmm, maybe Cathy-on-a-Stick says the same thing about YOU… :)I remember when pen pals wrote actual letters, on paper and there were envelopes and stamps and…how old am I? What year is it? Sheesh. 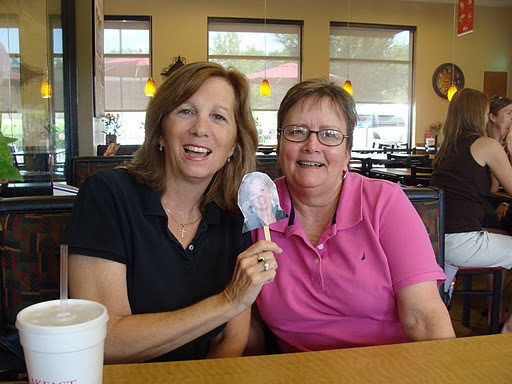 Cathy-on-a-Stick could use an extra peach milkshake! Madeline, I suspect the reason I never had a pen pal back in the day was because um…I didn't like to write. :-)The concept may be old-fashioned, but the sentiment's still very much in style! (Which is more than I can say for C-O-S. Talk about sheesh. )Val, she's whittling away, all right. But ain't nobody getting peach milkshakes around here but me! I LOVE that I have this wonderful group of blogger pen pals–like you and Becky Povich and so many many more that I've gotten acquainted with in your circle. Thanks for letting this PA girl pal around with you! Right back atcha,Clara! Visiting blogs is like opening a box of chocolates…you never know what you're going to get. And that's what makes it so much fun! Glad you had fun with Becky! And I still write letters the old fashioned way with pen and paper and send them in the mail. Send me your address and I'll send you a letter! That is so cool that you two got to meet and shared so many laughs! Good for you and Becky! How fun. As a matter of fact, I have a pen pal, Ruth, and we're going to actually meet for the first time in August in DC. I'm glad you both had such a good time. Yay! Donna, Becky is a hoot! And Anita, that's so cool! I want to hear all about it when you return! I'm starting to feel really, really blessed to know you personally. You are as wonderful as all your blogger friends already suspect. Wish I could've joined you and Becky on Monday! Thanks for all the nice comments about me, y'all…and I'm sorry you couldn't make it either, Debra! Maybe next time!